If your taste in sports tends towards the extreme then Red Bull TV is the app for you. 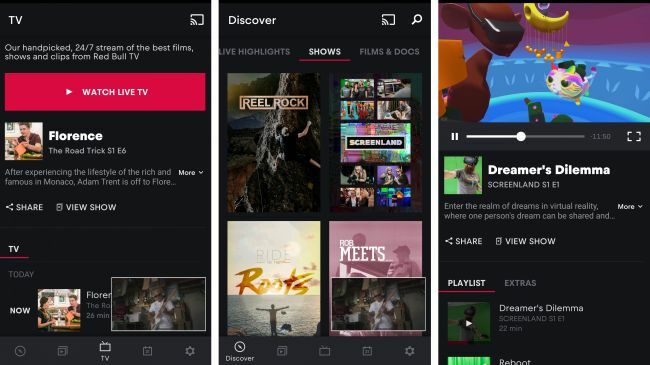 The app houses a wide selection of shows, films and documentaries focussed on the likes of BMX, surfing, rallying, climbing and more. These are available on demand, but Red Bull TV lives up to its name by also offering live streaming TV that you can tune into 24 hours a day, 7 days a week. There are also live sporting events broadcast on the app, such as the Red Bull Air Race and the UCI Mountain Bike World Cup, and a built in calendar tells you when these events are coming up, so you’ll never miss them. And Red Bull TV even goes beyond sports, broadcasting music festivals and shows focussed on video games and other aspects of popular culture. The quality of the content is variable but generally high. We’re talking full length sporting events with professional commentary, while the documentaries tend to be well shot. You can watch on your phone or tablet, and choose what quality to stream it in, which is handy if you’re relying on mobile data. Or, if you’re at home, you can also cast videos to a Chromecast or Android TV.